The new Elephant House at Copenhagen Zoo opened today following an official ceremony attended by His Royal Highness the Prince Consort of Denmark and his grandson, Prince Christian. This new Elephant House provides these magnificent animals with a stimulating environment, including easily accessible spaces for the public to enjoy them, and restores the visual relationship between the zoo and the park. The project has been driven by research into the behavioural patterns of elephants. The tendency for bull elephants in the wild to roam away from the main herd prompted a plan organised around two separate enclosures. Covered with lightweight, glazed domes to provide natural light, these enclosures are designed to bring a sense of light and openness to a building type traditionally characterised as closed. The spaces maintain a strong visual connection with the sky and changing patterns of daylight and the distinctive ‘fritting’ on the glazing simulates a canopy of trees. The varying levels on the site are exploited in cross-section. The elephant enclosures are set deep into the ground, ensuring excellent insulation on the perimeter walls and a natural fusion with the landscape. 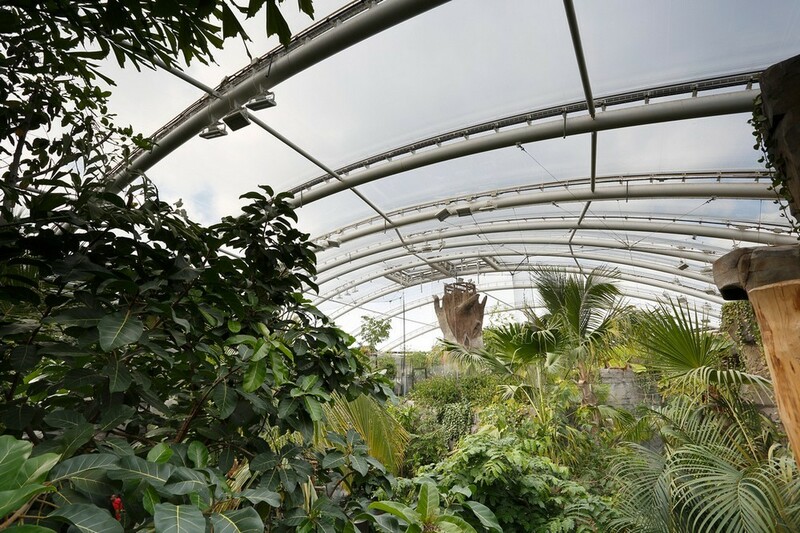 Additionally, the glazed domes have opening windows to allow natural ventilation and there is a heat recovery system – further enhancing the environmental efficiency of the scheme. The Elephant House is Foster + Partners’ first zoological building. Inserted into the natural contours of the site, it replaces a structure dating from 1914 and sets new standards in zoological design, providing the animals with a stimulating environment that recreates aspects of their former Asian habitat. It is built with a warm terracotta-coloured concrete and the yellow beach-like sand that naturally existed on the site has been recycled to create the paddocks. The colours and textures convey a sense of the dry riverbed as found at the edge of the rainforest – a favourite haunt of Asian elephants. With mud holes, scattered pools of water and shading objects, the new Elephant House is a place where the animals can play and interact naturally. Broad public viewing terraces run around the domes externally, while a ramped promenade leads down into an educational space, looking into the enclosures along the way. Copenhagen Zoo is the most visited cultural institution in Denmark, attracting over 1.2 million visitors a year and is set within an historic royal park, adjacent to the Fredriksberg Palace. The carefully considered landscape, designed by Stig L Andersson, seeks to reinforce the relationship between the zoo and the adjacent royal park and provides the public with more accessible viewing and educational facilities. New standards have been set in terms of the elephants’ well-being. The main herd enclosure will, for the first time, enable elephants in captivity to spend the night together, as they would in the wild. The ‘fritting’ pattern on the glazed roof canopies was created by sampling four species of tree. A computer script was written to rotate, scale and randomly populate the roof, so that no two ‘leaves’ are the same. The overlapping pattern provides naturalistic dappled light.